You can own your own RV for almost nothing! This program is designed to allow our customers to purchase a new RV and derive substantial income from it while retaining the use of it when they want to go camping. This program is tightly managed and dedicated to maintaining the owner's RV in excellent condition. This program is designed to allow our customers to purchase a new RV and derive substantial income from it while retaining the use of it when they want to go camping. This program is tightly managed and dedicated to maintaining the owners RV in excellent condition. This program is perfect for the RV owner that can't use their RV enough to justify owning it or those that need additional tax deductions. Depending on the unit, owners can make over $20,000.00 per year off the rental of their unit. In addition to the income, there are many tax benefits to this program. You supply the RV and we do all the rest. We have the renters and the most stringent screening process in the industry. We maintain the unit, collect the rental fees and damage deposits and send the owner an itemized statement and check once a month. If you're interested in learning more about this program, e-mail us today. These are the reasons we have several owners that have multiple units in our program. Once the RV is enrolled in our program, you'll be able to enjoy the following tax benefits. Expenses: You'll be able to deduct insurance premiums, maintenance costs and any upgrades you might want on your motorhome. These now become business expenses.If the RV was purchased in the state of Texas, you'll be reimbursed for any Sales and Use tax you paid when you bought it. This comes back to you from rental taxes we collect from the rentals on your unit. This can amount to several thousand dollars. 1.) How do I know my coach won't get torn up? Hands down, this is the single biggest concern of RV owners. The long and the short of it is that the renter is responsible for the coach while it is in their possession. The only exceptions are the normal wear items. Each renter is screened extensively and if you go back and look at the bottom of the Rental Rates sheet, you'll find the basic requirements that must be met to qualify to rent. When we fill out the Customer Information screen on our computer, we get answers to over 30 questions and record them, such as home and work address, home and work phone numbers, driver's license number, auto insurance company, agent and policy number plus many more. Each renter is given an extensive walk-through on the coach and must sign the Operating Instructions sheet. In addition, we take 6 pictures of the coach with a digital camera and load them into the computer under the renter's name. This keeps them from coming back later and saying the reason something broke or got damaged was because we didn't tell them how to operate it or that the damage was already done when they picked it up. In addition, each renter is required to read the Terms and Conditions and initial them in 4 places. These terms and conditions were written to protect the coach, the owner of the coach and American Dream Vacations. They clearly spell out what the renter is responsible for and the penalties involved if they don't adhere to them. Every coach is clean, full of gas and water and thoroughly inspected before it leaves. The customer signs that it's in good condition and that they agree to return it full of fuel and clean. If they don't, we clean it and or gas it and charge the renter. On the Vehicle Out form, it clearly states that we have 10 days to inspect the unit before refunding the renters damage deposit. This gives us enough time to check the unit carefully for anything that might be hidden. None of these things are of any use if we can't collect from the renter if damage occurs. To make certain we will be able to collect, each renter must pay for the rental in advance plus leave us a Damage Deposit. Go back to the Vehicle Out form abd read the last statement just above the renter's signature. The renter must sign here authorizing us to charge any balance due on their credit card. With this credit card authorization, the customer can't successfully dispute our charges to their credit card company. When you enroll your coach in our program, we must add it to our master insurance policy. You can drop your current insurance because our policy covers you, your coach, the renter and us. We keep a copy of the master policy on hand at all times and welcome our coach owners to go over it or speak with our insurance company to answer any questions they might have. As a rule, our cover age is considerably better than an individual policy. The renter is responsible for the deductible while the unit is in their possession. The cost of the insurance depends on the value of the coach and whether it's a motor home or a towable. The rates are slightly higher than an individual policy but the broader coverage is essential. Your individual policy won't cover you or the coach if the unit is for hire. The insurance premiums are deducted from your rental income each month and it's clearly spelled out on the Owners Statement. In addition, the cost of rental insurance is tax deductible since the vehicle is in a "commercial" rental fleet. 3.) What if I want to use my coach? It's very simple. When you know you want to use the coach, call or email us and we'll reserve it for you just as though you were any other renter. The difference being it will be a zero dollar reservation. From our website, you can also login to your unique owner's portal where you can reserve your vehicle for personal usage and monitor the schedule. When you pick it up, it will be full of fuel, water and propane. We'll light the refrigerator and water heater for you and check all the appliances, generator, etc. All we ask is that you return it full of fuel and cleaned so that it's ready to go out on the next rental. If we have a reservation on your coach for the period you want to use it, we'll make every attempt to switch them to another unit. 4.) How do I know my coach will be properly maintained? In most cases, our maintenance procedures are far stricter than the average owner's. When a motor home goes into the program, we fill out a vehicle information screen in our computer. One of the questions it asks is how often we want to perform maintenance on this vehicle. We also are required to enter the mileage when we receive the coach and the computer keeps track of how many miles are put on it. Each time a renter picks up the unit, we record the actual mileage and the generator hours. When they return, we again record the mileage and generator hours. When the unit has 3,000 miles on it since the last service, the computer automatically prompts us to let us know it's time to service this unit. When so prompted, we will change the oil & filter, check the transmission fluid, radiator coolant, brake fluid, batteries and tires for proper wear. 5.) Are people allowed to smoke in my coach? No. We don't allow smoking in any of our rental units. There is far too much risk that the upholstery or carpet could be damaged and many people are sensitive to the smell of smoke. Every renter must sign a sheet that clearly states that there is no smoking allowed in the coach. If they choose to ignore this rule, they will be charged a minimum of $350.00 so the coach can be fumigated and professionally cleaned to remove the after-effects from the smoke. This charge is purposely high to deter even the most stubborn renter. 6.) Who is allowed to drive my coach? Only the renter and those persons designated at the time the reservation is taken. Each designated driver will be required to give us their full name, address, drivers license and expiration date. The renter understands that they're the responsible party and will be charged for any damage or repaires due to negligence. 7.) What happens if the coach breaks down on the road? Every renter is told that they can repair anything that breaks and bring us the receipt for reimbursement for anything up to $50.00. If the repair is for more than $50.00, they MUST call us for approval and instructions. Items 4 and 6 on the Terms and Conditions clearly spell out the procedures that must be followed and our limits of liability. Our liability is limited to the reimbursement for any full rental days lost due to the breakdown and does not include any other expenses the renter might incur. Our contract specifically states that such things as the refrigerator, generator, air conditioner, etc. do not constitute a breakdown and no reimbursement will be forthcoming. Also, we've contracted with a national road sevice company called TTS (Truck Tire Service). They are a 24 hour/7 day per week road service and charge us only $40 plus parts/labor for a call. Once the unit has been repaired and returned to us, we will make the determination as to whether the breakdown was due to mechanical failure or negligence on the part of the renter. If we determine it was due to negligence or misuse, we will charge the renter for the repair. If the unit is still covered by a warranty, we will either send the renter to an authorized warranty station or file the claim ourselves upon their return. If it's simply a mechanical failure of a part not covered by a warranty, the owner will be charged for the repair as a part of normal maintenance. If a unit requires repair in excess of $200.00, the owner is notified before the repair is made unless it's an emergency or the owner can't be reached. 8.) What if my unit doesn't rent? How often your unit rents depends largely on what it is. The slowest renting coaches are 5th wheels. These units tend to rent better for long term rentals such as a person whose building a house and wants to be on site. Smaller travel trailers rent well for weekends and vacations. Motor homes and mis-sized trailers are by far the fastest rentals. Currently, demand is far greater than our supply. Our motor homes are averaging between 2 and 3 weeks of rental per month. If for some reason your unit doesn't rent during any given month, the insurance premium goes to half the normal rate for that month. While we can't guarantee the number of rentals your unit will have, we have excellent rental history to give you an honest estimate. At some point we will cap the number of units. We are committed to our coach owners and will not allow our supply to dilute the owners income. 9.) Where would my unit be kept when it's not out on rental? Our store is located on Interstate 10 between San Antonio and Boerne. Our lot is on 3 acres and is fully fenced, paved and lighted. We have approximately 300 ft. of frontage on IH 10 with great exposure. Our offices and shop are in a 9,300 sq. ft. building with an impressive southern mansion red brick front. The shop is large enough to accommodate 6 40' motor homes or trailers. The offices offer a very professional appearance. Our offices are fully computerized and we own the most advanced RV Rental Management online system available. 10.) How and when do I get paid? Owners statements and checks are mailed on the 17th of every month so they're received by the 20th. Each owner is paid for all rentals that returned and closed out during the previous month. The owners statement generally consists of 2 pages. The first shows any charges or credits for that month and the total amount due the owner. The second page lists all the rentals for the unit for that month. We have added a feature on our website where each owner has a unique log in and can view their rental activity and statements online at any time. Our website is a real time reservation system so it is always current. Why can American Dream Vacations get more money for your RV? A professional approach to consignment sales! So you've decided to sell your RV. A big decision since it's probably one of your most valuable assets. You think, "What's the best way to sell it? How much should I ask for it? Where should I advertise it? Should I use my work phone number in the ad? What if I'm not home when they call?" These are all important questions and the answers can be critical. If you haven't considered consigning your RV, maybe you should. At American Dream Vacations we have the right answers to all these questions plus many more. You're first thought on consignments is probably that you'll be charged a fee for selling it. Money you could save if you sold it yourself. Right? Wrong! Not that we won't charge a fee for selling your unit because we will. This is how we make our living. Where you're wrong is that ?it's money you could save by selling it yourself?. In most cases, the fee we charge is more than offset by the amount we can get you for your RV. As a rule, we can get between 10% and 15% more for your unit than you can. One of the biggest reasons why we can get more for your RV is the fact that we can offer long term financing to a potential buyer. Think about it. The only way we can make any money is by selling our consignments. As consignment specialists, we don't have our own inventory to compete with your unit. We have to sell your RV if we hope to make a living. If you list your RV with us, you can rest assured it will be aggressively marketed and we will get every penny we can for it. Now you can have a partner that's just as interested in selling your RV as you are. If your interested in our Consignment Sales Program, please contact the location you prefer. American Dream Vacations. Aggressively advertise and market your unit to insure maximum exposure to qualified buyers. Thoroughly inspect your unit when it arrives on our lot so we'll both know it's current condition. 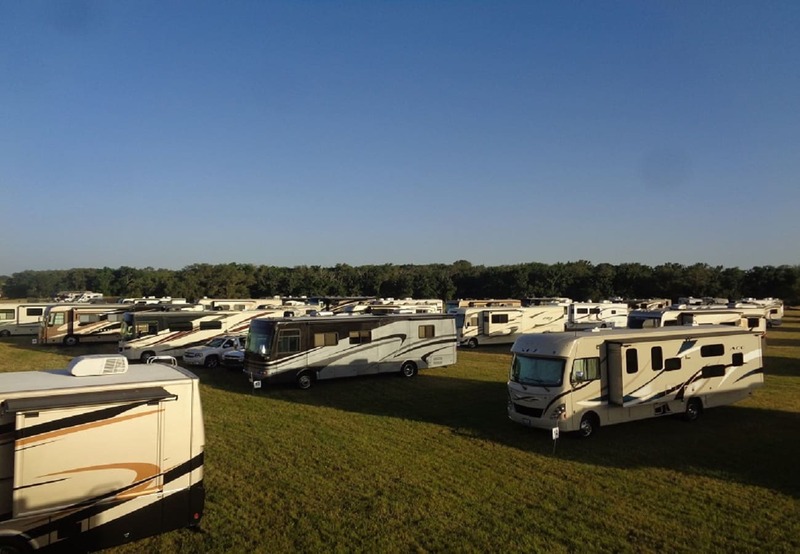 Store your RV free of charge in our fenced and lighted lot as long as it's for sale. Take the hassle out of selling your RV! Screen and qualify prospective buyers and handle all the paperwork. Treat you and your RV with the utmost respect. We act as your agent from start to finish and approach every transaction with professionalism. We can offer a buyer financing! We can offer a buyer insurance! We can offer a buyer an extended service contract! We can deal with a buyer's trade-in without affecting you! We take Visa, Mastercard, Discover and American Express! We have a neat, clean, paved, fenced and lighted display lot! A prospective buyer has more confidence because we have a fixed location they can go back to with questions. We aggressively advertise our consignments! We are a licensed bonded dealer! We handle all the title work! We fund your sale upon closing! We act as your agent and represent you to maximize your $$$$$! We have set business hours that you and a prospective buyer can rely on! How to enroll and what it costs! Bring your RV to our lot. Together we'll go over the coach and fill out a Condition Report. Together we'll evaluate your unit by booking it out in the NADA Book. We'll make recommendations on pricing based on this book, the condition of the unit and our knowledge of the market. You determine what we ultimately will ask for your unit. We will ask you for a net figure that you want to end up with. Our fee is simple, we have to make our money on top of what you want out of it. We both sign our simple, one page consignment agreement. It's written in plain English and has no "fine print". You can remove it from the program at any time and if we don't sell it, it costs you nothing. Go home and relax!